keeping the tank clean and well maintained works best, and assures the greatest yields. 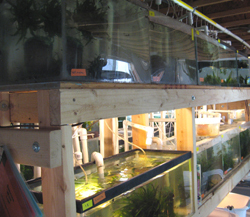 low stress and healthiest conditions, as well as holding down on predation of fry. breed as normally and often as possible, and most livebearers generally prefer harder water. obvious, but those are the two main reasons when breeding fails. from easy to access to better foods is essential. 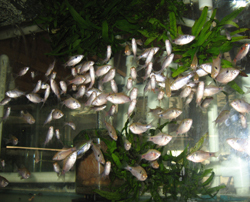 covered in Breeding Livebearers and Breeding Puntius padamya. Click on each pic at left to enlarge. and Poecilia maculata (a wild platy), done many years ago in the early years of the hobby. as is the case with many crosses. 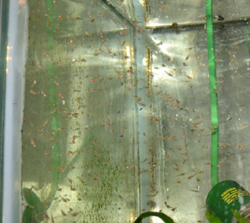 released into a tank of helleri swords, for example, is no guarantee of platy/ swordtail fry. and used, but other means can be used first to encourage hybridization. patient- establishing a trait can easily take years..
and evaluated. Then choose the healthiest individuals as breeders for each generation. black, normal eyes) These fish are often hardier and more consistently fertile than albinos. mutation, the fish that resulted were infertile. that are well represented in the hobby, and an albino X. mayae occurred here about a year ago. leucistic coloration in any of the Odessas. 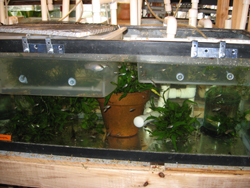 comfortable, smaller breeding tanks with lots of fine leaved plants for the fry to hide in. fish or alive, but less healthy fish to their own breeders at this time to raise separately. For more information on raising mutations, such as how to breed to develop a trait, click here. particularly the goodeids, are the easiest of fry to raise. 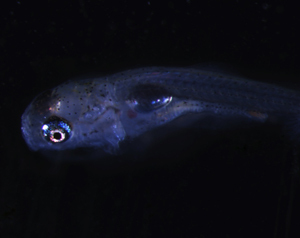 labor intensive to get more than a small percentage of the fry to survive to adulthood. food, when they need it, are the biggest issues to deal with. temperature, light, and of course the species you choose to work with will dictate your experience. Check out the Section on Breeding the Puntius padamya "Odessa"
heart just ahead of the left lower portion of the air bladder. Top pic- This is what you work for. Odessa fry at about 3 weeks. out until this size (6 mos).